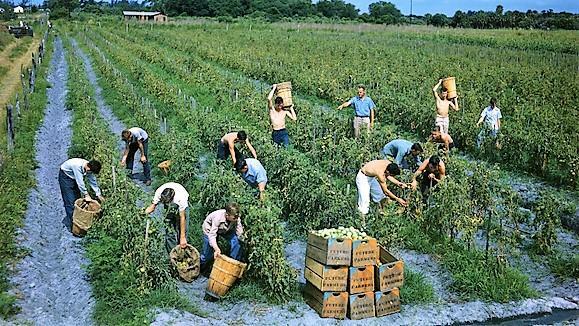 Future Farmers of America picking tomatoes in Palmetto, Florida. Those conditions put workers at risk for heat stress, heat stroke, exhaustion, cramps and severe rashes. According to the National Weather Service, heat was the leading weather-related cause of death in the U.S. over the past three decades. Florida is already one of the worst states in the nation when it comes to rates of heat-related hospitalizations. In 2016 alone there were 1,112 documented hospitalizations in the Sunshine State, according to the Centers for Disease Control. Emory University’s Valerie Mac conducted the new study along with researchers for advocacy groups Public Citizen and the Farmworker Association of Florida. 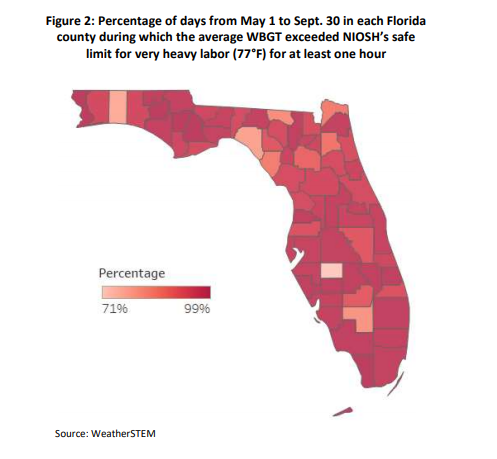 They analyzed temperatures for all of Florida’s 67 counties between May 1 and Sept. 30, 2018, and combined that data with health indicators from a previous study Mac conducted, called the Sunflower study. That study, funded by the National Institute for Occupational Safety and Health, had 250 workers in Florida wear equipment and sensors while on the job. Researchers also collected blood and urine from the participants. 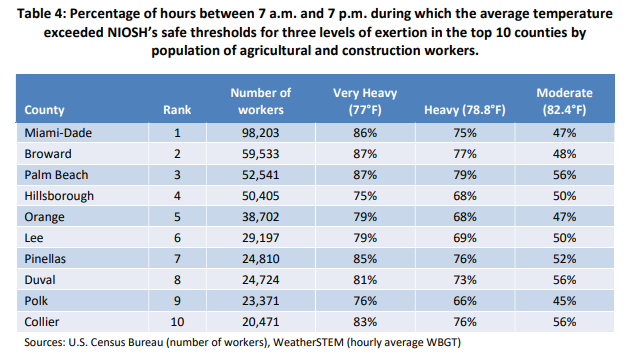 The latest study examined how many times workers would have been exposed to a too-high “wet bulb globe temperature,” or WBGT, a measure that accounts for air temperature, humidity, wind and radiant energy like direct sunlight. 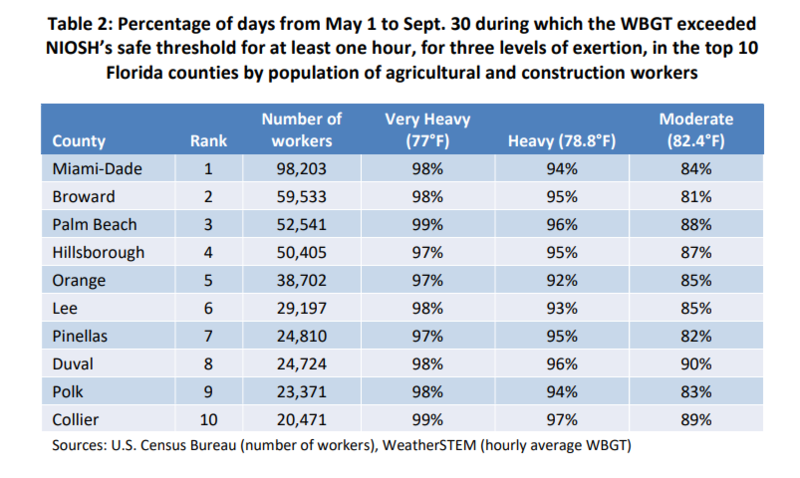 “For workers engaged in very heavy labor, it was dangerously hot at least 75 percent of the day time, this past May to September, in the top 10 Florida counties by number of agricultural and construction workers,” said David Arkush, managing director of Public Citizens’ Climate Program. The threat of heat-related illnesses is on the rise due to global warming, the researchers said. According to the New York Times, 17 of the 18 hottest years on record have occurred since 2001. The latest report from the Intergovernmental Panel on Climate Change shows that human-induced global warming has already reached 1 degree celsius (1.8 degrees fahrenheit) above pre-industrial levels, and if the current warming rate continues the world could reach human-induced global warming of 1.5 degrees celsius (2.7 degrees fahrenheit) by 2040. 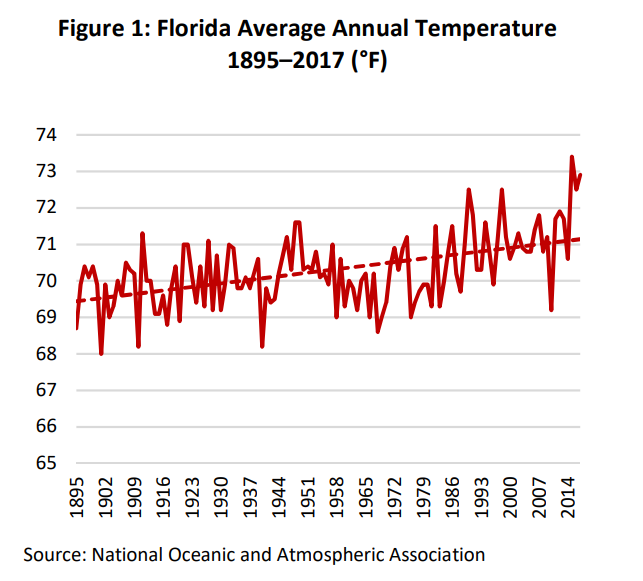 Meanwhile, Florida’s average annual temperature has been steadily rising since 1895, and that trend is expected to continue and even accelerate. According to the Fourth National Climate Assessment, rising average temperatures mean the number and intensity of extremely hot days will rise more rapidly. “The warming is speeding up, and even if we were to halt all greenhouse gas emissions tomorrow we’ve already locked in another half degree celsius of temperature rise. And along with the rise in these annual average temperatures, the number of individual extremely hot days is rising even faster. So we’re getting more heat waves and more intense heat waves. There’s a wide range of projections for what we can expect,” Arkush said. He said policymakers could decide to ban outdoor work during the hottest days, as has already been done in other countries. Public Citizen and the Florida Farmworkers Association are among more than 130 organizations petitioning the U.S. Occupational Safety and Health Administration to enact rules protecting workers from heat stress. Requested protections include access to drinking water, shade and rest breaks. That echoes the warning from the IPCC this month. Visitors to a haunted house in Delray Beach last weekend were greeted by a mermaid living in a trash heap and pictures of a polluted ocean projected onto the wall. The next room was even more bleak. The polar ice caps had melted, and everyone in coastal areas drowned. Further into the house, a girl left bloody handprints as she banged on a window from the outside, and a boy lay on a gurney, spinning an electric drill and mumbling about applesauce. They were both driven mad by a new epidemic gripping the post-apocalyptic world. South Florida is on pace to see two feet of sea-level rise in the next 40 years. That means higher insurance costs and saltwater threatening the region's drinking water supplies, among other impacts. A coalition of southeast Florida counties is leading the state in responding to vulnerabilities caused by climate change and sea-level rise, according to state environmental leaders. On Thursday, officials and planners who represent Monroe, Miami-Dade, Broward and Palm Beach counties met at the Southeast Florida Regional Climate Leadership Summit to discuss progress on issues linked to climate change. Noah Valenstein, the secretary of Florida's Department of Environmental Protection, thanked the more than 300 people gathered.